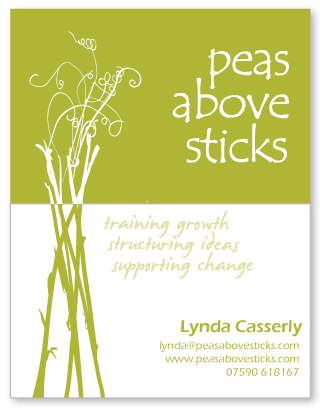 With years of experience working for various companies designing and delivering corporate training, business enterprise and advice, Lynda Casserly decided to set up her own business, Peas Above Sticks (from an old Lancashire saying, referring to pea shoots growing taller than their support canes - 'be more than you thought your could be'). Having already helped me with invaluable start-up business advice and support, I was delighted when she asked me to design the branding, stationery, templates and promotional material for her new venture. 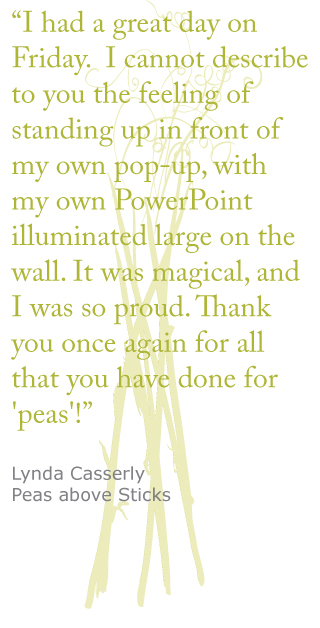 Working with Lynda's ideas, I produced a hand-drawn image representing the pea shoots, and I applied this to the designs for Lynda's corporate stationery, training, report and proposal templates, PowerPoint template and pop-up banner.